The following pages contain various extended sections and features which have been added or expanded since the first edition of Sun, Steel and Spray, as well as introductory pieces and further reading to suppliment information provided in the book. We'll also add to these pages any new interesting information on the Victoria Falls Bridge which comes to light from our continuing research. The Bridge Builders - the story of the men sent out by the Cleveland Bridge Company to build the Victoria Falls Bridge. 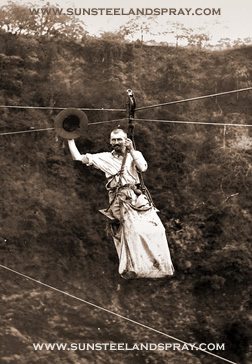 The Flying Fox - a look at the first man to cross the gorge, Mr Fox. 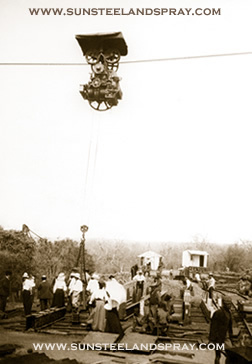 Focus on the Blondin - an extended text and photographic piece looking at the mechanical transporter used in the construction of the Victoria Falls Bridge. The Jack Tar - the story of the small engine which helped build the Bridge. Bridging the Zambezi - the story of the building of the Victoria Falls Bridge. Tragedy Strikes - the story of the tragic death of Mr Samuel Alexander. Completion of the Victoria Falls Bridge - an article from the London Daily News, 10 May 1905, interviewing Sir Charles Metcalfe and Mr Hobson, designer of the Victoria Falls Bridge. Official Opening of the Victoria Falls Bridge - Details of the official opening of the Victoria Falls Bridge, 12 September 1905. Accidents and Incidents - a look at the human cost of the construction of the Victoria Falls Bridge. Falling for the Falls - The tall tale of Trooper Ramsay. Epic Adventures... and Fabulous Beasts - a look at some of the more adventurous travellers and tall tales relating to the opening up of the region. A Tale of Two Boats - a look at the strategic importance of the bridge during the First World War. The Lion of Africa - an extended section on the exploits of German Lieutenant Colonel (later General) Paul von Lettow-Vorbeck in southern Africa during the First World War. Strengthening And Reconstruction Of Deck - reconstruction of the top deck of the Victoria Falls Bridge - from the Rhodesia Railways Bulletin, Nov 1929. Bridge Gangways - installation of the Victoria Falls Bridge gangways - from the Rhodesia Railways Bulletin, July 1937. Diamond Jubilee Paint Job - from the Rhodesia Railways Magazine, August 1963. Victoria Falls bridge not for dismantling - an article from the Bulawayo Chronicle, 21 March 1980. Sun, Steel and Spray References - A selected list of key references from the book. The following links to external sites containing information on the history of the Victoria Falls Bridge. Victoria Falls Bridge, To the Victoria Falls. A study of the Victoria Falls bridge, Geoff's Trains. The Great Zambezi Bridge, Engineering Wonders of the World, Volume 1, Edited by Archibald Williams, 1909, Pages 90-101.